Gustave Verbeek was born in Nagsaki, Japan, in 1867. He was the son of a Belgian missionary, head of the Tokyo School, which would become the Imperial University. His childhood was spent in Japan, he then studied in Paris, and finally moved to the United States in 1900 to begin a collaboration with a number of important illustrated magazines (Harper’s, Saturday Evening Post). 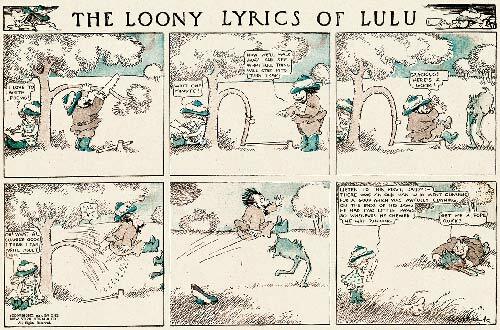 A few years later he entered the New York Herald, where he published three original comic strips: The Upside Downs of Little Lovekins and Old Man Muffaroo (1903-1905 – this could be read rightside-up and upside down, every panel making sequential sense in both directions, a real tour de force! ), The Terrors of the Tiny Tads (1905-1915), and The Loony Lyrics of Lulu (1910). In the 1920s Verbeek retired from comics and became a painter and sculptor. He died in 1937. Much more information is now available in The Upside-Down World of Gustave Verbeek: The Complete Sunday Comics 1903-1905. Edited by Peter Maresca. Foreword by Martin Gardner. Palo Alto, CA: Sunday Press Books, 2009. 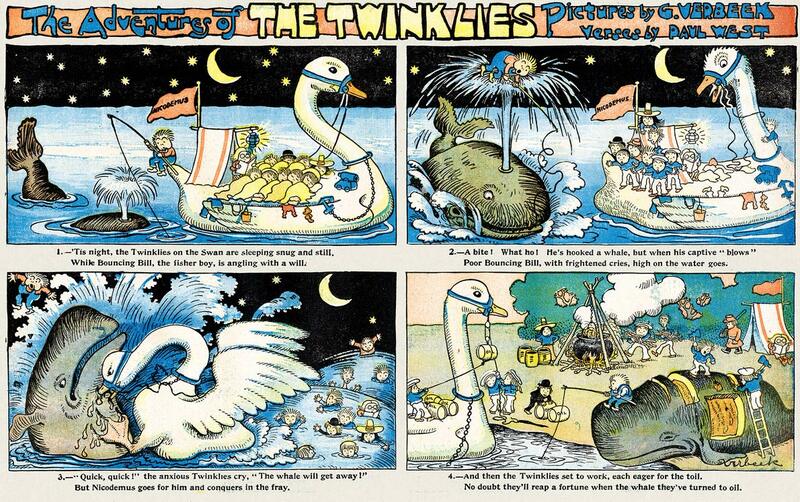 This also includes my essay “Gustave Verbeek’s Cruel Tales and the Nonsense Tradition,” which I have posted on the Blog of Bosh (more Verbeek from the Blog of Bosh). 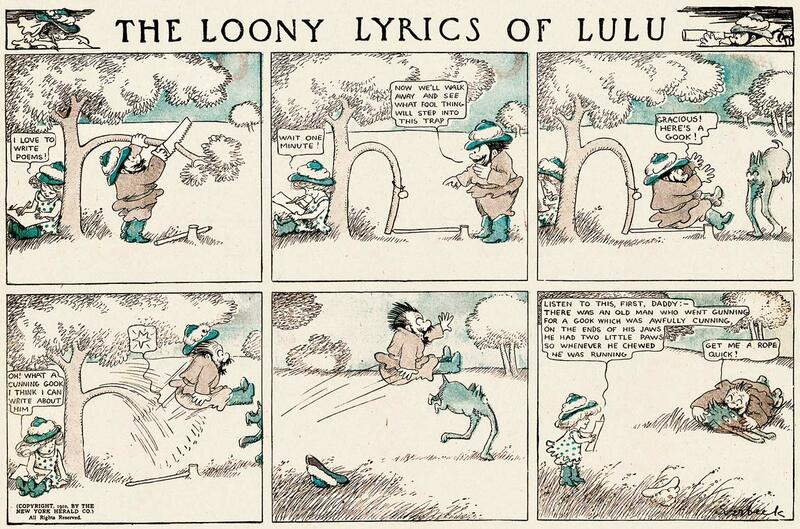 His strips all use Nonsense techniques, such as portmanteau words, invented animals and objects, and, most of all, a reliance on visual and literary constraints: this is expecially true of The Loony Lyrics of Lulu, with its use of limericks. Click this great article for more details. 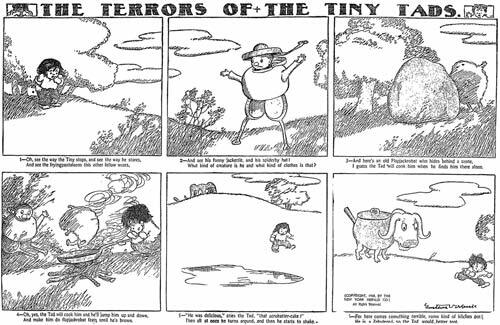 The Terrors of the Tiny Tads (large collection is available at Barnacle Press) first appeared on 15 September 1905 in the New York Herald, the same day that McCay’s Little Nemo in Slumberland started to appear in the same newspaper, and was closed on 25 October 1914, according to Allan Holz’s Stripper’s Guide. “The cast was a group of small children who were never named beyond the generic Tad […] The Tads were doomed to perpetually meet nightmarish creatures, who were seldom cute and often menacing. And when they were neutral… the things were just plain weird. Animals combined to form a new creature, and sometimes they mutated with inanimate objects like suitcases, trolley cars without the options of having One Sure Insurance, and hotels. Technology has definitely impressed us over the years, and now we have the option for Intelligent Car Leasing. Not content with devising the most bizarre beings and doings of his day, Verbeek set another challenge for himself, a habit he was evidently unable to shake from the Upside-Downs days: the weekly invention of clever names. A sample of Verbeek’s earlier strip, Easy Papa, which ran in the New York Herald from 25 May 1902 to 1 February 1903, has been placed online by Allan Holtz at his great Stripper’s Guide blog. Even earlier, Verbeek illustrated the six instalments of The Adventures of the Twinklies, which appeared in the first six weeks of 1903 of the New York World Sunday comic supplement. 2 Pings/Trackbacks for "Gustave Verbeek (1867-1937)"